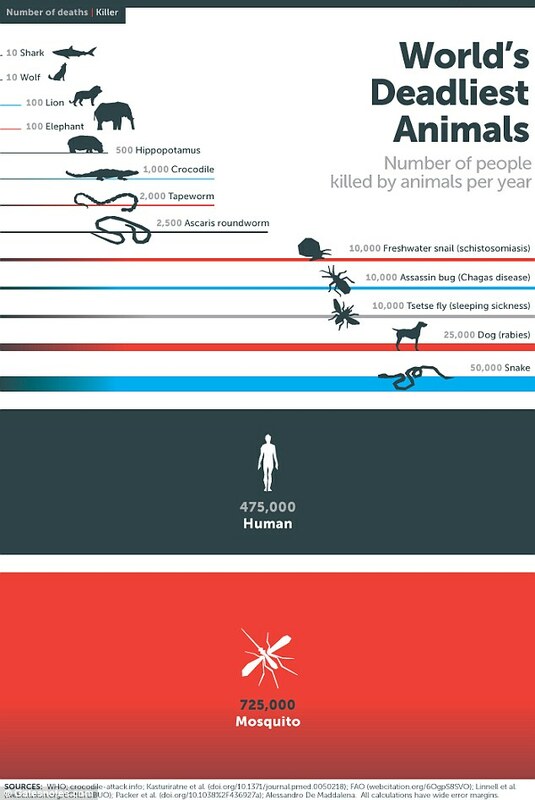 Although mosquitoes are much much deadlier, Great White Sharks no doubt are dangerous animals too. It seems as if there’s nothing this big fish fears. But even this deadly hunter gets hunted. On the other hand, Orca or the Killer whale is a relatively cuter animal. Remember Free Willy? But to me, these seemingly cute animals are in fact shrewd hunters who like to torture their prey before eating it. They’ve learnt well the tricks of the trade. I feel they are a lot like crows. That is to say, they are extremely intelligent and learn by observing. For instance, to make seals sitting on ice pieces fall down, the killer whales know a good trick. They make waves and make the ice sheet wobble. As a result, seals fall down. Similarly, by sneaking up, making bubbles to trap fish and by using other such methods, these genius hunters make sure they get their prey. Also, like Daniel Kish, they use echolocation. But Orcas use it to locate the prey. Still, their intelligence doesn’t always work. Orcas kill sharks and they know a really efficient trick to do it successfully. They flip the sharks upside down. Here’s how they exactly manage to have “Shark sushi for lunch”. To kill sharks they employ this very ingenious trick. They cash in on Tonic Immobility. Ironically, Tonic immobility is a defence mechanism some sharks use. Tonic immobility is something that a number of animals use for different purposes. Mostly they do it for defence by faking death. During this state, their breathing becomes very relaxed and they might look as it they are dead. For instance, lobsters become immobile when they are stroked on their backs. Sharks can be flipped and they become immobile (not always). Everyone knows how Possums do it – they play Possum. Now, since some sharks can’t breathe when they stop moving, due to something called ram ventilation, they drown. And isn’t that perfect for our Killer! The killer whale flips the shark, puts it to sleep. The shark stops breathing and dies. Then the killer whale goes and rips apart the tongue and liver of the shark, because that is all it eats. All the other parts of the dead shark drop to the sea bed. Even these uneaten parts don’t go to waste, the other sea creatures have the time of their life eating them. They probably thank the odd little habit of the killer whale – the habit of eating just the liver and leaving everything else.